We used to wear these shirts during holidays and competitions, on top of all our other clothes. They are made from reindeer skins, and made really well, very soft. This one has leather that’s been dyed, but there are all sorts of different ornamentation that you can use. 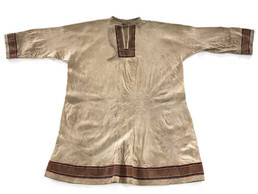 This Even shirt is made of soft-tanned reindeer hide, ornamented with contrasting strips of dyed leather and piping of red wool. The shirts are worn for holidays and competitions that include reindeer racing. Translator(1): He thinks this is a shirt from the area he’s from, because people still have these kinds of shirts and still have the methods for making them. They collected it in the Amolon Eloi area. He thinks this is a shirt done by Yukaghir, because of the way that the markings are on it. But it’s not only Yukaghir anymore. He can send a photograph where he is wearing a shirt just like it. So Evens also make shirts like these as motifs, so it’s an Even/Yukaghir style. We used to wear these shirts during holidays and competitions, and you wear it on top of all your other clothes. Short sleeves for competition. And you can see they’re made from reindeer skins, made very soft. . . . This is just one type. There are all sorts of different ornamentation that you can use. But the idea is that it is worn during holidays and competitions mostly by young people. Older people don’t wear them. Aron Crowell: He said this was for competitions, what sort of competitions? Translator: Races on deer, foot races, it’s common that when you have a holiday, that people gather and young people, children, even women have different competitions. Translator: So the Chukchi way of tanning a hide is either using urine or some part of the reindeer. But this is prepared differently; this is a Yukaghir/Even way of preparing a hide. The Chukchi hides are usually smoked, but these aren’t smoked. This type they twist the hide. They twist it and twist it. The advantage to preparing the hide like this is that the hide becomes white, that’s the real value to this. The Chukchi will soften the hide by rubbing on a stone or with a type of board. The advantage to the Even way is that they twist it. 1. This consultation was held with Russian speakers and only the English translation was transcribed.